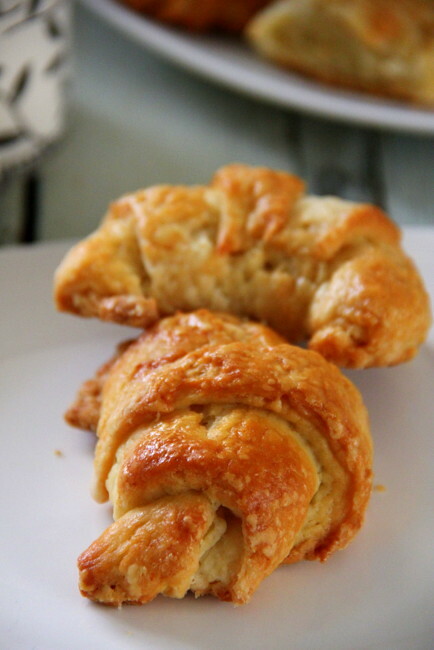 Spicy Chilly: Classic Croissants~ Now you can bake them at home! 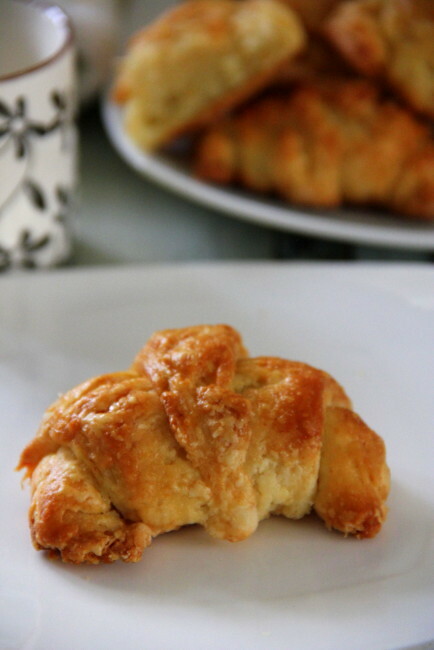 Adapted from Jeffrey Hamelman's Recipe at Fine Cooking. 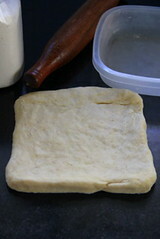 Lay a yardstick or tape measure lengthwise along the top of the dough. 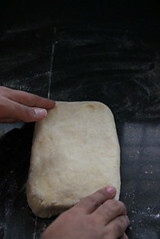 With a knife, mark the top of the dough at 5-inch intervals along the length (there will be 7 marks in all). 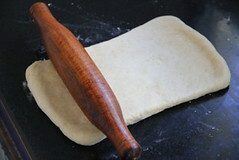 Position the yardstick along the bottom of the dough. Make a mark 2-1/2 inches in from the end of the dough. 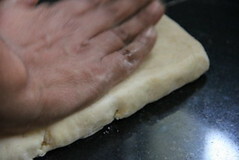 Make marks at 5-inch intervals from this point all along the bottom of the dough. You’ll have 8 marks that fall halfway between the marks at the top. Make diagonal cuts by positioning the yardstick at the top corner and the first bottom mark. 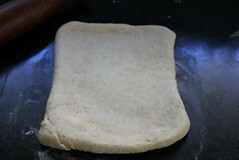 With a knife or pizza wheel, cut the dough along this line. 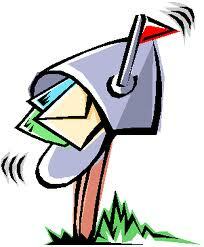 Move the yardstick to the next set of marks and cut. 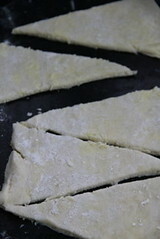 Repeat until you have cut the dough diagonally at the same angle along its entire length—you’ll have made 8 cuts. 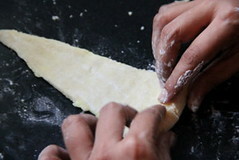 Now change the angle of the yardstick to connect the other top corner and bottom mark and cut the dough along this line to make triangles. 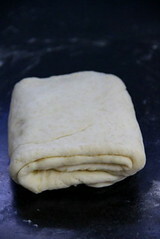 Repeat along the entire length of dough. 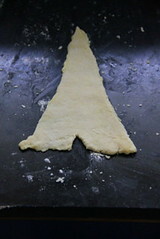 You’ll end up with 15 triangles and a small scrap of dough at each end. 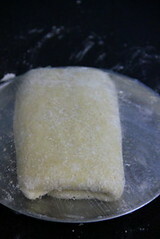 With one hand on each side of the notch, begin to roll the dough away from you, towards the pointed end. Flare your hands outward as you roll so that the “legs” become longer. Press down on the dough with enough force to make the layers stick together, but avoid excess compression, which could smear the layers. 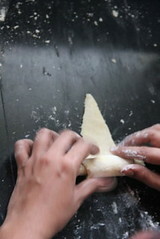 Roll the dough all the way down its length until the pointed end of the triangle is directly underneath the croissant. 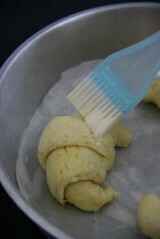 and gently press the tips of the legs together (they’ll come apart while proofing but keep their crescent shape). 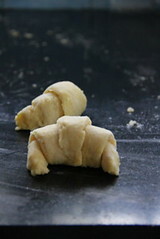 Shape the remaining croissants in the same manner, arranging them on parchment-lined rimmed baking sheets . 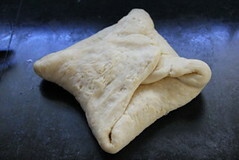 Keep as much space as possible between them, as they will rise during the final proofing and again when baked. The ingredients were halved. 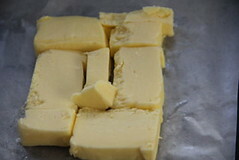 During rolling out on Day-2, the butter square was kept to 5 inches, the dough was rolled out to a rectangle of 6/12 (width/length), folded and repeated two times more as per the recipe, maintaining the same dimension. 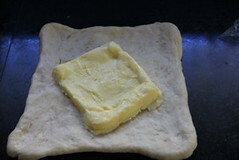 The correct halved dimension would have been 4/12, but I was advised to make it 8/12 (keeping the original width to 8) I found it a little tough, as a first timer to extend 5 inch wide butter square to get laminated/extended to 8 inches. 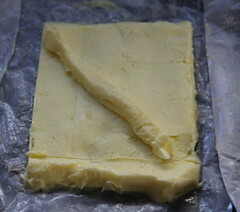 The butter was cold, still I had leakages while rolling and hence restricted to 6 inches for safer side. 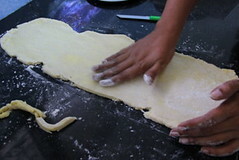 The leaked holes were dusted with extra flour and worked with, as patching with dough will not help for this recipe. We, the bakers were warned to stay away from patching the dough, as we might end up with butter pooling at the bottom during final baking! On Day- 3, the rectangle was spread further lengthwise to the dimension of 22 inches. 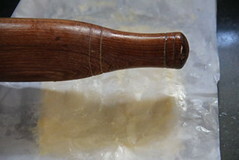 I found it still difficult to increase the breadth to the full 8 inches as the butter leakage through holes was getting bad. 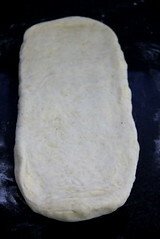 8 inches is the full dimension as the original recipe calls, to work with half of the dough. 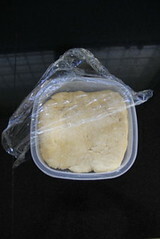 I had to work with the full dough, since I halved the recipe without, dividing as into two parts. 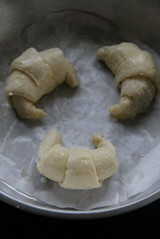 Also, since I have a basic round oven, I was forced to bring down the sizes of the croissants. 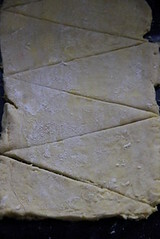 Hence the triangles were marked at the interval along the length of the dough at 4 inches, with the width 6 inches(full width of the dough rolled as such). 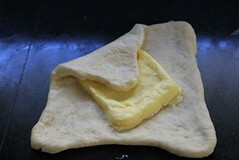 Further spreading of the cut triangles, made the dough thinner before shaping and the medium sized Croissants turned out perfect! 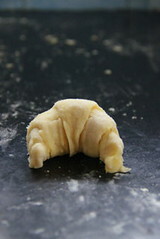 After cutting out 6 triangles (for 6 croissants), I froze the remaining dough for pain au chocolat. We had fun and tons of discussions in the group baking these challenging cuties, throughout the month! Each baker had the same emotion before the start; a roller coaster ride of anxiety combined with fear before handling the dough :). 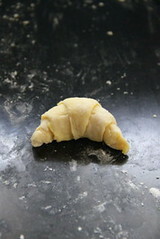 Each one of us shared the picture of freshly baked croissants, with the experiences of flaws and success. 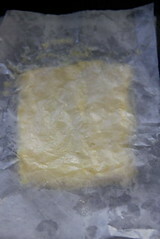 This helped the rest of the bakers much, who ventured later. 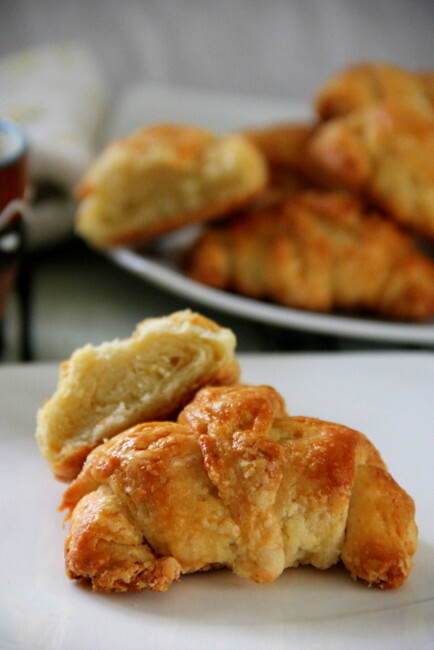 If we can bake them, you too can! 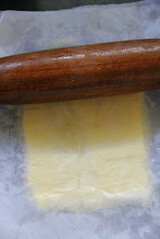 Awesome bharathy :) i could not see the leaking of Butter ! 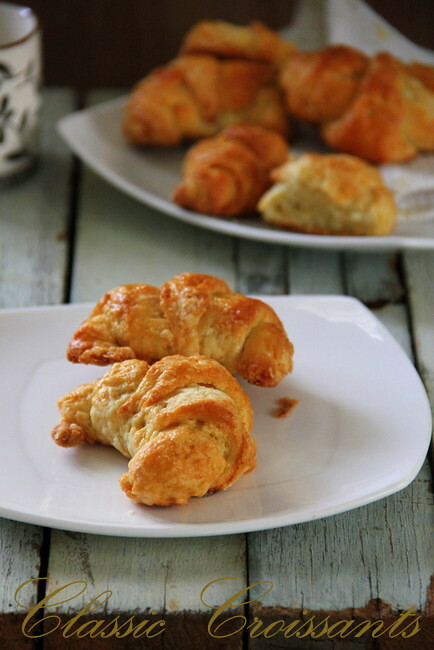 looks perfect, and loved the pics..
well made, very delicious croissants...loved its golden brown color! They look fabulous! Love the color on them! Wow! 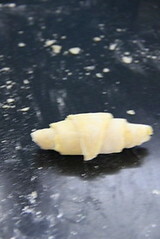 Great.Looks fantastic and tempting me more..
wow it is real hard work and it shows! I am happy to see that you did not choose to make the alternate recipe. 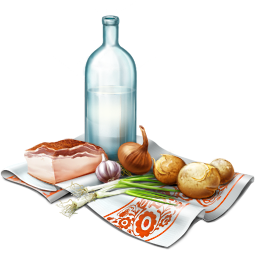 I know how difficult and what a handicap it is to stay in a town that can provide all possible hurdles to a recipe that needs more things to be right than one. 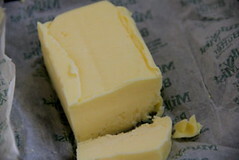 Gorgeous & buttery!! They look amazing & kudos to all your efforts!! Looks so tempting and perfectly made,nice clicks.. Proof that teamwork brings amazing results!! :) These look really great! wow what a perfection.Loving it first time to your space and so happy to know you. Looks perfect and so delish! 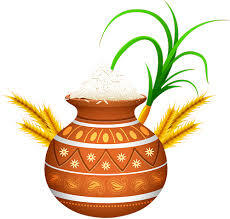 If time permits try to participate in "Tried and Tasted : Chettinad Kitchen". 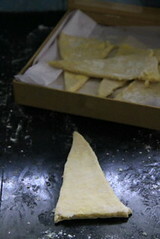 Here is the link for it http://elvisalakshi.blogspot.com/2013/02/tried-and-tasted-event-chettinad-recipes.html. The event is from Feb'15th to March'15th.